Quick! 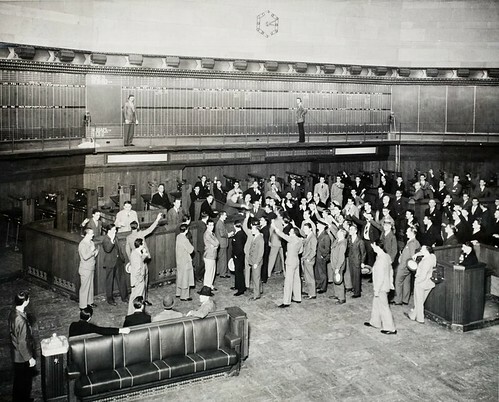 What was the first transaction held in the brand new Los Angeles Stock Exchange Building on its first day of business, January 5, 1931? What’s the banner’s VS mean? 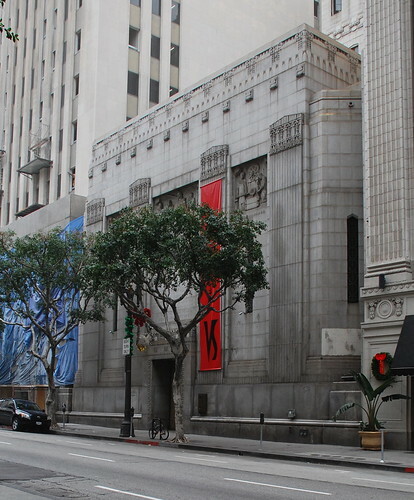 On December 7, 1899, a group of oil men lead by Wallace Libby Hardison met to organize the Los Angeles Oil Exchange to promote their industry, figure out how to get more investments, and set up a marketplace for related securities. The Exchange’s first trading session was on February 1, 1900, in the Yosemite Building on South Broadway, with seats selling for fifty bucks. At the end of the year, on December 23, the powers-that-be broadened the market’s services and renamed it the Los Angeles Stock Exchange. The object of the L.A.S.E. was to “furnish Exchange rooms and other facilities for the convenient transaction of their business by its members to maintain high standards of commercial honor and integrity among its members and to promote and inculcate just and equitable principles of trade and business.” Whew! 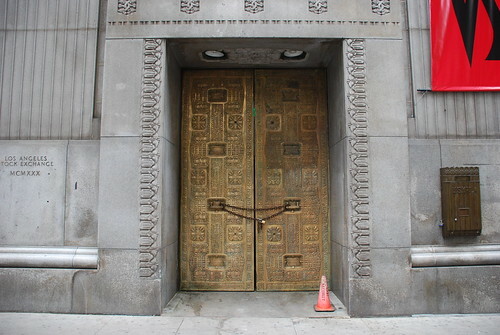 Twelve-foot tall bronze doors/orange traffic cone. The architect for the future landmark was Samuel E. Lunden. (I know this all seems like ancient history now, but Lunden, born in Chicago and raised in Pasadena, died relatively recently, in 1995, at the age of 97). Donald and John Parkinson were consulting architects, and Roger Hayward, Lunden’s future partner, gets the assist. 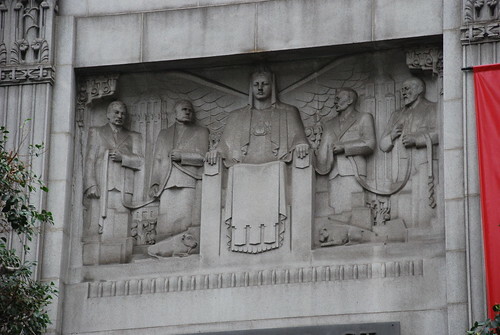 While the Exchange’s board wanted a neo-classical design like that of the New York Stock Exchange, Lunden felt that look out of date, so they agreed to more of an Art Deco design. The project’s general contractor was the P.J. Walker Company. And talk about good timing: ground-breaking was held October 21, 1929, just three days before Black Thursday. 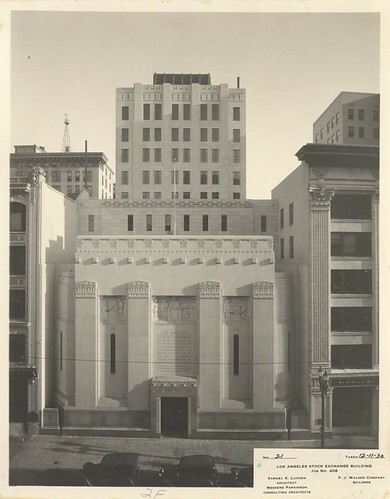 From the CA State Library's online photo collection. 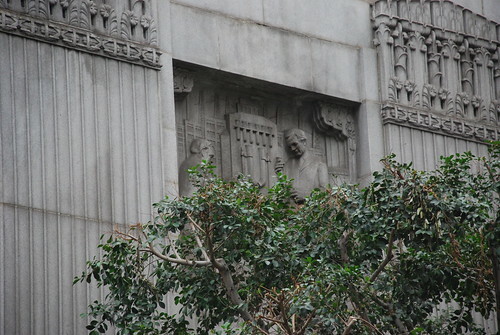 There’s a limestone and gray granite front portion fifty-three-foot tall, while a reinforced concrete and terra cotta construction of eleven stories – the city’s height limit in 1929 – stands in the back. It must’ve been somewhat reassuring in the early 1930s to know the Exchange was housed in such an austere, fortress-like building. Included in the $1.75 million structure was a fifth floor clearing-house, a statistical department, and a large auditorium in addition to a smaller lecture room with space for fifty. Offices were on the sixth through ninth floors, and a club with a library, card room, billiard room, and reading rooms were planned for the top two floors. A 2,660-square-foot printing room was located in the basement. 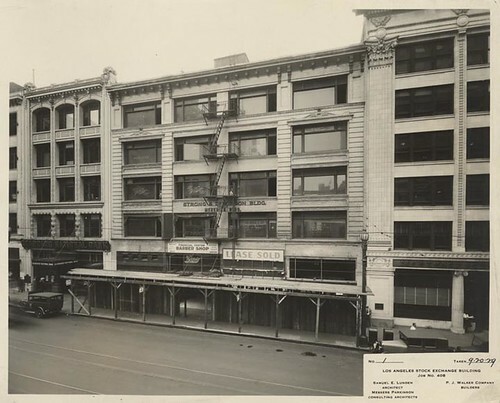 The building’s highlight was its 90’ x 74’ balconied trading room with a forty-foot ceiling and sixty-four booths. The top image below is from a 1939 pamphlet published by the Exchange’s Public Relations Committee. I’d love to see the basement’s vault, its ten-ton door having been set up to emit “choking clouds of smoke and tear gas” in “the presence of an oxy-acetylene torch”. Actually, I’d like to see any of the interior, the decoration of which sported ancient Near East and Indian influences via the hand of designer Julian Ellsworth Garnsey. 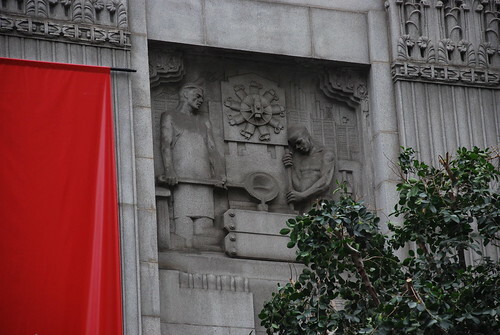 Too, there’s the entrance lobby’s ceiling with four sculpted figures found in its corners, courtesy of the Wilson Studio. They represent Speed (Mercury), Accuracy (the archer), Permanence (a figure contemplating the universe), and Equality (the figure bearing scales). 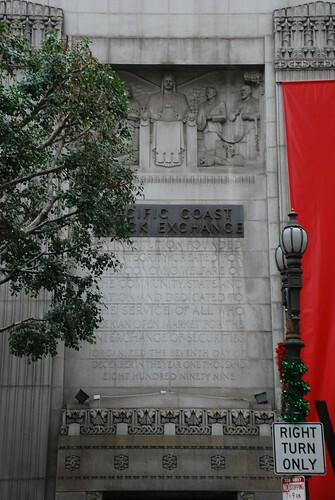 The Los Angeles Stock Exchange opened for business in their new home on that winter day with its president John Earle Jardine presiding. 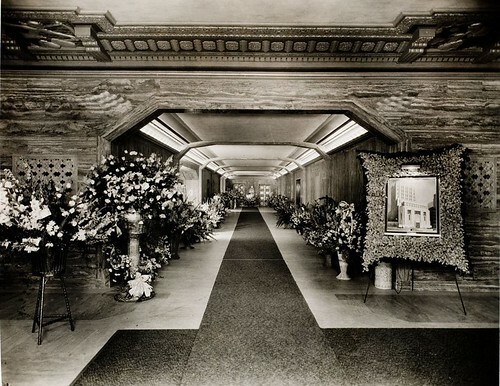 (J.E.’s dad, John Jardine, was a Civil War gunboat designer and NYC architect who drew the plans for Manhattan’s Fifth Avenue Baptist Church and several Carnegie libraries. He killed himself in 1924.) Transactions that inaugural day were valued at about $545,000. 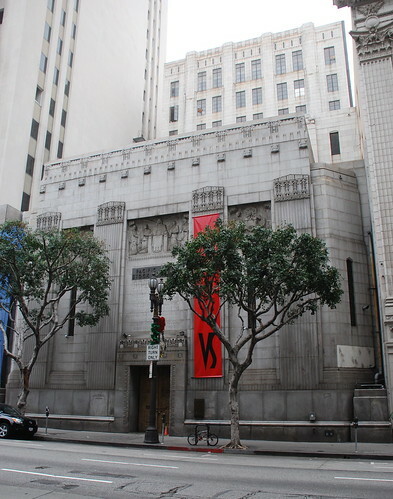 Starting about a year after the Pacific Exchange vacated the city monument, the building briefly served as the nightclub ‘Stock Exchange’ (Samuel E. Lunden was reportedly a consultant). Does anyone know of any plans for the building these days? Through the alte 80s and 90's it stil used to hold dance parties there every now and then. I am in New York now (and too old for circut parties) so I don't know if they stil do. Thanks, Scott. I don't think they do, but I could be wrong. I'd certainly be the last to know if they did. Note: as soon as it opened it was closed for some violations. Thanks, Victor Atomic. Looking at the Angelenic link, I'm apparently the only person who didn't know Versus (hence the VS) is now the club occupying the space. I was there in the 80's. Oh and the club 7th Grade at the Pacific Design Center. Sorry Floyde, I'm going off track here. Wow! Thanks for this site. It brought back a flood of great memories. I was a specialist clerk for Bateman Eichler Hill Richards on the PSE trading floor in the 70's. It was very slow. The Dow Jones Industrial average was around 650. I guess that's why I went to Law School. It kind of puts things in perspective for what's happening now. The first floor interior was a beautiful orange/brown stone of some type. They had a lady who took you to the trading floor on the second floor in a great old manual-operated elevator from the 30's. It's funny that it became a bar/dance club. Thanks for checking in, anonymous. What will you do when the Dow Jones hits 650 again? 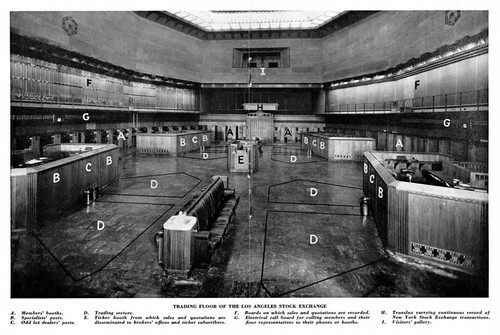 I'm actually thinking of writing a screenplay about the 1920's stock fraud which occurred at the then-named Los Angeles Stock Exchange. Approximately 40,000 investors lost over $150 million. All the corporate executives were acquitted in a subsequent criminal trial, because the LA District Attorney accepted a bribe (he subsequently was convicted and sent to San Quentin); as well as the bribery of a few jurors. In a later civil trial one of the corporate executives was shot dead in open court, by an angry investor. It's a fascinating story and there's much more I'm discovering in my research. The interior of the building has been undergoing renovations for several months, for the most part in order to bring it up to code. The former exchange floor is now a state-of-the-art nightclub with a fantastic sound and light system, all done without displacing the look and feel of the exchange once housed there. The rest of the building is going to need a good deal more TLC to return in to its former glory. There are offices on the first floor that have been renovated and are in use, but that's about it. The vault you wrote about is still there, although walking into it feels a bit like visiting the titanic. Nevertheless, its an impressive, if imposing sight. 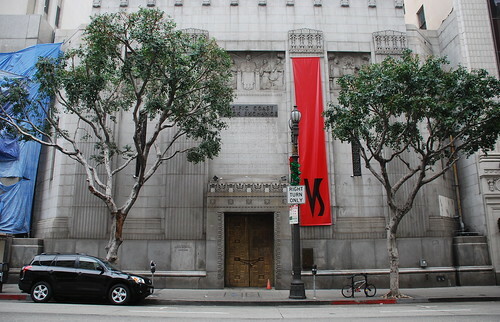 Hopefully one day soon the building will reopen and the public will once again have a chance to take in a bit of LA history. Thanks for the update and link, anonymous. There was a gallery space open in one of the ground floor rooms at the Art Walk last week. What an amazing interior, so austere. Thanks, Emma. What a great Tumblr you have. Thanks, really enjoying your blog too!